Pentair Clean Air Systems is specialized in the environmental controls and monitoring for manufacturing industries. We assist our customers with the world-leading technologies in reverse jet-pulse cleaning systems for dust collectors. 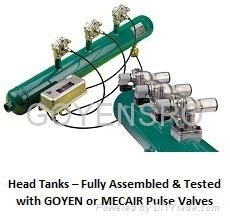 We supply pulse valves, pulse control systems, header tanks, level probes and dust monitoring systems. Pentair has been the global leader in products and solutions for dust collectors for years. 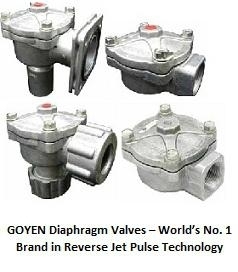 Through our brands Goyen and Mecair the Clean Air Systems category offers products and expertise focused on the best and most efficient reverse pulse jet filter cleaning solutions for dust collectors. These products are renowned for their quality, robustness, high performance, innovation and ease of installation. Their technology is acknowledged as market leading, offering tailored solutions for the world’s dust collector manufacturers and system users. Pentair offers a complete range of Tribo-Electric Dust Emission Monitoring system, with thousands of successful installations worldwide, Pentair understands the specific requirements of industry, and can tailor an effective solution for even the most challenging application.